I'll be the first to admit that we're a bit late to the party when it comes to reviewing the all new, 10th generation Accord. The car with the 1.5 liter turbo four cylinder has been out since late last year, and the 2.0 liter engine version has been around since about February. 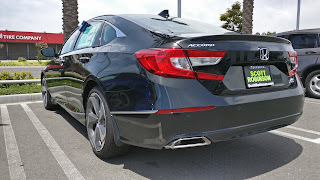 As the owner of a 2016 Accord Touring V6 though, I still felt it was relevant to review this car, as East Brother and I are considering it as a potential replacement for our current Accord. So how does it stack up to our current Accord?